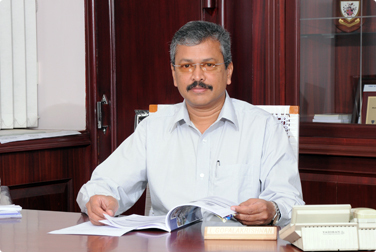 G. Rangaswamy internationalized education in the PSG Campus. PSG Institute of Advanced Studies was established to promote inter-institutional and international collaborative programs with universities in the UK, Germany, Switzerland, Luxembourg and so on. A tie-up was established with San Diego State University, USA for student exchange. The MoU with Toledo University was revived by him and the first batch of students was admitted in 2006. In recognition of the successful partnership, the University of Toledo conferred upon him an honorary doctorate. Student exchange programs were also established with Australian University. A staunch environmentalist, he promoted various activities for the same. He was the force behind the construction of a new library building, the Institute of Pulmonology and the Aesthetic Centre at PSG IMSR. Additional buildings were added in PSG College of Technology for the new courses introduced in the fields of Biomedical and Nanotechnology. A Fitness Centre, the International Students’ Block and a Food Processing Unit were started at PSG CAS under his aegis. He laid the foundation stone for the construction of a new hospital at Karadivavi on 2 acres of land donated by Mr. K. L. Varadarajan and family. The Badugas Association of Kothagiri donated land to construct a hospital at Kothagiri during his tenure. Adding to the growth of the branch of medical sciences, the PSG College of Pharmacy was started under his aegis. The hitherto growth of the PSG group of educational and associated institutions was stupendous. As competition grew, it became imperative to stay ahead and focus marketing strategies on core competencies. PSG Centre for Advertising was born from the group's need for effective and efficient marketing. In the new millennium, primary education has also undergone a shift in focus. The PSG Children's school, focusing on developing the natural creative instincts of children was founded under Shri.V.Rajan's leadership. The group also established its stance in health care management by starting the PSG Offshore Health Care Management Services. Spurred by the on set of the liberalisation era, he laid the foundation for the PSG Institute of Management. An increasing number of students started looking for opportunities in paramedical sciences. Thus was born the PSG College of Nursing and the PSG College of Physiotherapy. An entrepreneurial park, PSG STEP that provided the necessary fuel to accelerate the dreams of aspiring professionals was set up during his tenure. During his tenure, the accent was laid on strengthening the foundations of learning already established by the PSG group. The Centre for Non Formal Education and the Centre for Sponsored Research and Training Centre were started as part of his contributions. The PSG Textile Research and Training Centre was also started during this time. GV also saw ample opportunity to extend the branches of education to medicine as well. The PSG Institute of Medical Sciences and Research was started under his leadership. The PSG Hospitals was a natural extension of the medical institute. Whilst giving the public state-of-the-art medical facilities, it also helped students of the medical college, grasp the essentials of practicing medicine. In the industrial front, Dr.GRD opened the Nilambur Foundry division. As the years grew, the foundry gained prominence and catered to a large portion of the Industrial Institute's needs. As technological edge started making a difference in establishing core competencies, the crucial consolidation of the PSG College of Technology took place during his tenure. A variety of new courses was introduced in the PSG College of Technology. GRG as he was affectionately known was instrumental in focusing on the development of the PSG Industrial Institute. It was during this time, that the institute gained a sharp focus that has made it the nucleus of the PSG and Sons' Charities. The Maternity Centre, now known as the Vedapatti Health Centre and the Gandhi Rural Centre was opened to give the people of rural areas, better access to health care. Foreseeing the need for a college that would provide students with a variety of academic interests, under the aegis of Shi PSG Ganga Naidu, the PSG College of Arts and Sciences was started.